No, this is not an opening line to a joke. In actuality, this is the first time that the Buffalo Beauts have played a playoff game in the “Queen City”. These gentlemen are here to spectate with the rest of the 900-plus who bought tickets in advance. That does not include all of the folks who bought tickets upon arrival, and have given the rink more of a “standing room only” scene. Each of the aforementioned gentlemen is likely in his late-70s or early-80s. They work their way through the hustle and bustle of the fans, and find a spot to sit near the press box. Throughout the course of the game between the Beauts and the Boston Pride, these gentlemen discuss in depth what they are witness to. Stating certain hockey-minded thoughts as “Gosh, that no. 23 – she’s so fast!” and “Wow, no. 3 has a whale of a shot from the point”. There is a great amount of detail in the game for these men to take in: the Beauts first home playoff goal causing the building to erupt, the team coming from behind to tie it up and force overtime, the roar of the crowd, some officiating that drew both a “Bronx cheer” and sincere applause for a good call, and of course the natural ebb and flow of the game between the two teams embattled on the ice… And then, splendid victory for the hometown Beauts in OT. It’s working, folks. Can you feel it? People in larger numbers than ever are giving it a chance and are witnessing firsthand that the NWHL is exciting hockey and a league that even casual hockey fans can get behind. Neither of these gentlemen had a granddaughter on either team or had been to the HARBORCENTER before – they just wanted to see a hockey game. And boy, did they ever get one. The NWHL game – it’s working. You sold out a building in a hockey-starved city and you filled it with all sorts of fans. Since the inaugural 2015-16 NWHL season, Beauts coach Ric Seiling finds himself in the Isobel Cup final for a third straight year. Speaking with Seiling after the game, there appeared to be two obvious sentiments on his face. Firstly, let’s everybody take a moment to catch their breath after what they just witnessed. And secondly, a true sense of joy that his players had the opportunity to share in an experience like this. “Oh, there was people out tonight?” he teased. But then he became more serious about how the Beauts existence grew and culminated into a moment such as this, and what it means for women’s hockey. This team has done a tremendous job of that thus far and continues to do so. The Mar. 17 victory was slightly rocky at times, but in the end the Beauts came together and pulled it out, as has been their modus operandi for 11 straight games. Beauts defender Sarah Edney jumped up into the play in the opening period and fired a shot into the top right corner to make it 1-0 Buffalo. The roof just about came off the building as the energy of all attendees finally released in elation. From here though things started to look doubtful for Buffalo. After Edney’s goal at 10:53 of the first, Boston’s Heather Schwarz knotted it at 1-1 just over two minutes later. The teams remained deadlocked for the rest of the first, and then the Beauts fell behind when the puck tumbled through traffic at 9:36 of the second period and ended up in the back of the Buffalo net. While it took multiple bounces and likely hit more than one player, the goal was credited to the Pride’s Mary Parker with assists to both Lexi Bender and Kaliya Johnson. 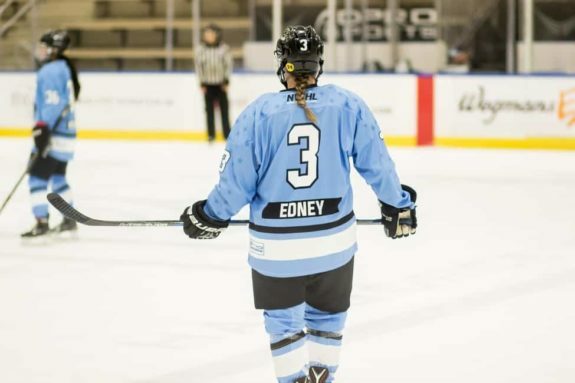 The Beauts Sarah Edney opened the scoring for the Beauts in first period after she jumped up into the play (Patrick Crosby Photography). What did not help matters was that for the entire game the two goaltenders Amanda Leveille of the Beauts and Brittany Ott of the Pride were trading save for save. You knew that it would be a one goal game. With Ott only allowing one goal on 23 shots through the first two periods, it became an uncertainty as to whether the Beauts could come back. Here is where Buffalo’s captain Corinne Buie stepped up. Buie had played a tremendous game all night long as it was anyway. She forechecked as if she were possessed and never once laid off the gas pedal. Part of what has made Buie a perennial champion and true leader if there ever was one is that she can play a very physical game, but plays between the lines where it is done fairly. More than once during the game Buie put a Pride player onto her backside but did it just by playing aggressive hockey – nothing she did was deserving of a penalty or could even be construed as body checking. It is something to behold when seeing her play this style. Just over four minutes into the third period Boston’s Emily Field went to the box for a body checking infraction. With the Beauts on their third power play of the game, the captain did her best and tied it on a feed from Kristin Lewicki. Seiling and his players recognized that Buie’s tally was when the momentum changed in their favor. Leave it to the team captain and two-time Isobel Cup champion to rise to the occasion. Special teams, and specifically hard work on the power play, have always been the difference maker in playoffs no matter what league you are speaking of. Beauts coaches Seiling, Muni, and Tom Draper all played in the NHL and at various other levels, and can attest to the importance of special teams. Goaltender Leveille, who arguably had just as big of game as Buie, spoke further to what the timeliness of the goal meant for the team. Outside of the locker room, fans and spectators may not have fully realized how integral Buie’s goal was and what a prevailing calm it ended up being. Leveille was able to explain. It would be fair to say that Leveille is “in the zone”, so to speak, and even that might not do her present level of play the proper justice. The 23-year-old netminder has just gotten better and better as the season has moved along, and she always seems to be at her very best come playoff time. Including the two most recent of her three NCAA championships with the University of Minneosta, Leveille’s teams have played in four consecutive championship games between her NCAA and NWHL careers. 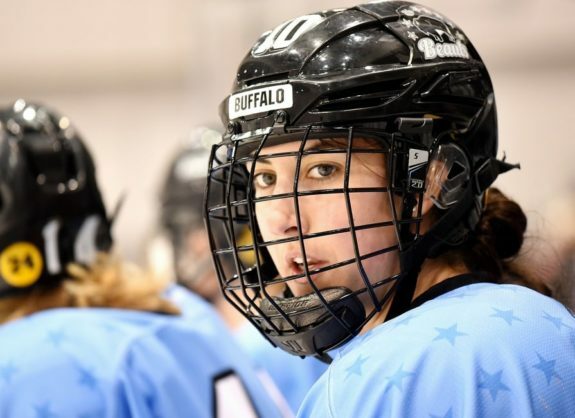 Buffalo Beauts goaltender Amanda Leveille stopped 34 of the 36 shots she faced in the Isobel Cup semifinal against the Boston Pride (Photo Credit: Troy Parla). Leveille stopped 34 of the 36 shots that she faced in the game, including one stop in the overtime period. Through 61:21 minutes of ice time she ended up posting a .944 save percentage between the pipes. Some of the saves Leveille made were head-shaking and she even made a few without her goalie stick earlier on in the game. You can bet the ranch that she will continue to be at her finest now heading into the final. Then we have the real “hero” of the game, although Sarah Casorso will easily praise everyone else well before she gives herself any credit. It’s just in her character to be humble, but she came through when it mattered most. A member of last year’s Isobel Cup-winning Beauts, Casorso played 33 NWHL games between regular season and playoffs before she scored her first goal. It just so happened that the first goal ended up winning the game for the Beauts 3-2 in OT. “She saved her first goal for the right time,” Seiling smiled. At the end of the third period Boston’s Field took another penalty, this time for tripping. With the Beauts on the power play Casorso came off the bench and at just 1:21 of the OT session, and wired a shot from the point that went through traffic and beat Ott. Casorso herself was not even certain that it had gone in until she had seen her teammates joyous reaction. Shocked in a wonderful way. What is interesting to note is that despite not having scored an NWHL goal prior to this one, Casorso has long been one of the better offensive-defenders on the team. Through her 31 regular season games between this year and last year, the 5-foot-7 blueliner compiled 16 assists. Her nine this season tied her for second most assists on the team with Elia, and were the most of any Beauts defender. The goal itself was made extra special with the defender’s father in attendance at the game. Casorso hails from Kelowna, British Columbia in Canada, and so it is quite the long trek for hometown family and friends to come see her play in Buffalo. Scoring that goal with her father there to see made her understandably teary-eyed. After the Mar. 17 victory, the opponent for the Isobel Cup was yet to be determined. 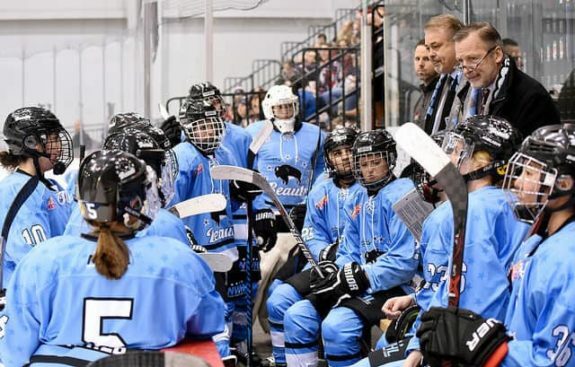 We now know that the Beauts will be facing the The Metropolitan Riveters in New Jersey, after the Rivs eliminated the Connecticut Whale 5-0 in their semifinal. There had been a sincere hope among most – if not all – of the Buffalo fans and some of the Beauts themselves that the Whale would defeat the Riveters. Stemming from the final standings, a win by the Whale would have meant that Connecticut would have come to Buffalo to play in the final, as opposed to Buffalo traveling to New Jersey to face the higher seeded Riveters. The Buffalo fans hadn’t gotten enough – they wanted more NWHL playoff hockey on their home ice. Maybe they are inspired enough to make the journey to The Garden State. The inspiration swings both ways. The Beauts players and coaches were also blown away by the support and presence that their community showed. “It was unbelievable,” Buie said. “The crowd really helped us. It was such a good atmosphere to play in. I was standing on the line before the game and I said to ‘Cheese’ (Lisa Chesson), ‘I’m just so proud to play for Buffalo here’. No other team in the league has the fans that we have. It’s all been since the Pegulas. It’s really helped us getting that marketing behind us, and to have that building really helped push us to win today. The players themselves need to take some of the credit too. Seiling himself realizes that the success of his team this year comes from the innate qualities of who his players are as individuals, and how they bring those positive personalities together as one unit that truly cares for each other and works for each other. There are 22 players on the Beauts’ roster. Nine of them won the Isobel Cup last year. There is nothing that those returning nine want to see more than for the other 13 to have their names inscribed on the Cup too. They are halfway there.